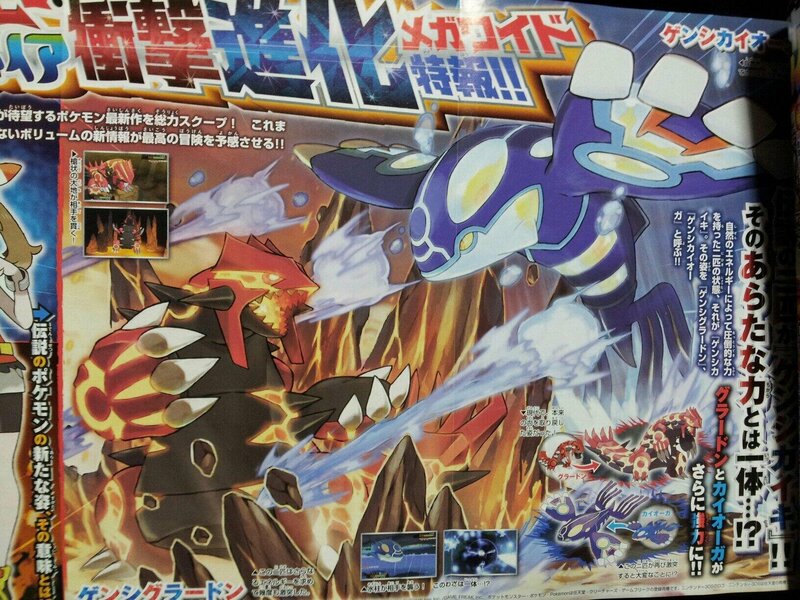 Even more info on the new Pokemon Ruby and Sapphire remakes has surfaced just before E3. 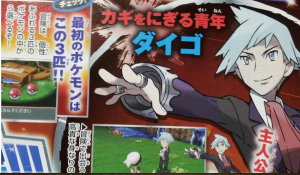 New scans from the Japanese magazine Coro Coro reveals a ton of new information. 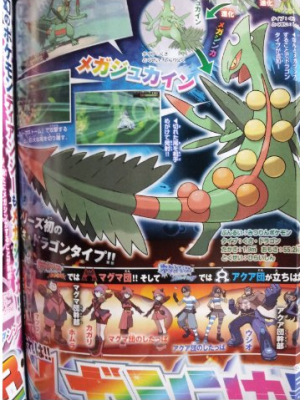 Firstly, the starter evolutions, Swampert and Sceptile, will be getting mega evolutions. 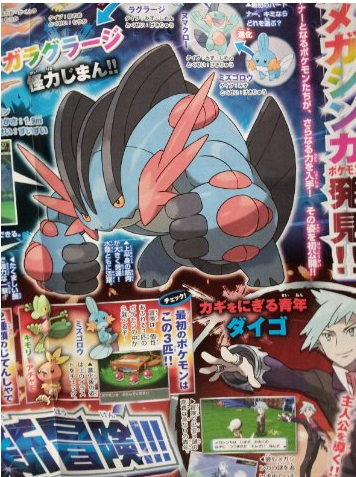 Mega Swampert is still a Water/Ground type, and has the ability, Swift Swim. Mega Sceptile will be Grass/Dragon, and will have the ability, Lightning Rod. We also see Mega Diancie, which will be Rock/Fairy type. Team Magma and Team Aqua will be making a return, with Maxie and Archie remaining the leaders respectively. The new character designs have also been revealed for Brandon and May. 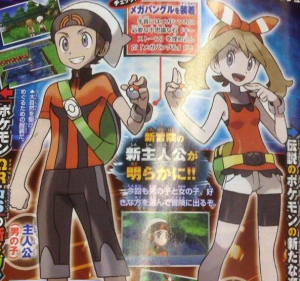 It is unknown if we will get the same kind of character customization we had in X and Y. 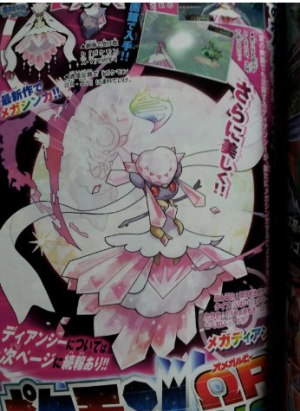 Instead of the Mega Ring, the Mega Bangle will be used to make Pokemon Mega Evolve. Champion Steven Stone is back with a Mega Charizard X, and is on a journey to discover the secrets of Mega Evolution. 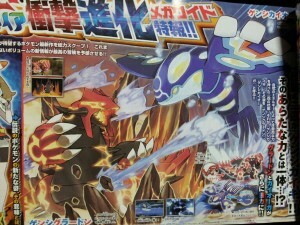 And lastly, legendary Pokemon Kyogre and Groudon will be getting a new type of form or mega evolution. These new forms are rumored to be either Atom, Prehistoric, Primal, or Primeval. If it is the Atom form, it is said to be caused by some sort of atomic regression. If it is the Prehistoric, Primal, or Primeval form, then it is said to be caused by “Ancient Devolution”. The website Serebii has changed its information from Atom to Prehistoric/Primal/Primeval, so it’s most likely the latter. 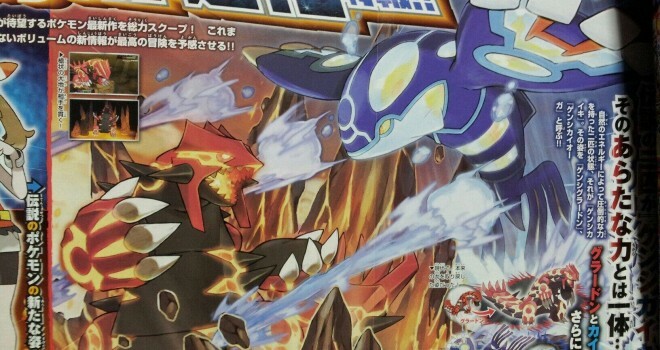 This new “evolution” would explain why both Kyogre and Groudon are glowing on the cover art. E3 hasn’t even arrived, and we’ve already gotten quite a lot of information about these games. On top of that, Pokemon Get TV will be revealing even more info on June 18. Be sure to keep up with Gamin Realm for E3 2014 reports and more updates on Omega Ruby and Alpha Sapphire.